I come from a family that likes to celebrate landmarks – whether it be birthdays, anniversaries, or important dates, we never like to let an occasion go unnoticed! 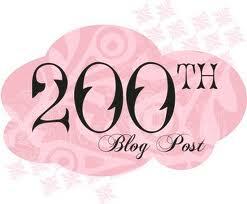 So for this reason, and this reason only, I am delighted to let you know that the previous post, A mother’s love, was my 200th Blog Post! I’ve been regularly updating this site since its inception in May 2011 and I have now had 10,384 hits in this 17 month period – quite an achievement! I intend to continue writing for the forseeable future and hope that the content stays interesting to you, my valued readers. Now, what shall I write about next? Posted on October 21, 2012, in General and tagged 200th post, anniversaries, birthdays, important dates, landmarks, May 2011, occasion, October 2012, valued readers. Bookmark the permalink. Leave a comment.